Almost forgot completely about this. It's SuperPhillip Central's 300th review! The conclusion of 3DS Week ends with my review of Kid Icarus: Uprising, a hotly anticipated game from the mind of Masahiro Sakurai, the man behind Kirby, Meteos, and Super Smash Bros. Is the return of Pit triumphant or terrible? Much like when the Ice Climbers appeared in Super Smash Bros. Melee, when an angelic boy named Pit wound up as a playable character in Super Smash Bros. Brawl, the general consensus from unknowing owners of the game asked "who is that?" 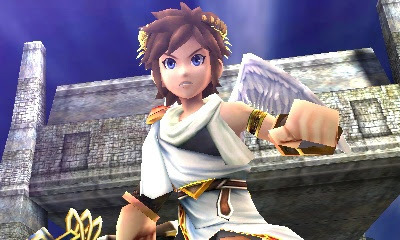 It has been over twenty years since the series Kid Icarus soared onto a Nintendo platform, and now the precocious Pit has returned thanks to the assistance of Super Smash Bros' creator in Kid Icarus: Uprising for the Nintendo 3DS. The game was one of the first titles announced for the system a couple of E3s ago. Is this a heavenly return for Pit, or do his wings burn up? Twenty-five years ago the Underworld's ruler, Medusa, was demolished at the hands of our hero, Pit the angel. Since then her defeat has fueled her incessant rage towards Palutena, the goddess of Light, Pit, and the human race. Medusa calls upon her Underworld forces to strike above ground, causing doom, disaster, and destruction. 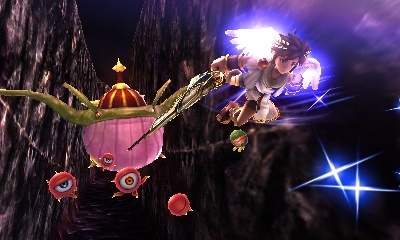 It is up to the sassy goddess Palutena and her humble servant Pit to save the day. The story has plenty of twists and turns and will last most players anywhere between 7-10 hours for one run. What makes Kid Icarus: Uprising's story so endearing is the extensive amount of tongue-in-cheek, self aware, charming dialogue that constantly breaks the fourth wall and ensures that you know that you are playing a game. There are an abundant amount of Nintendo and past Kid Icarus games references, and they are all done exceptionally well. Basically, take Star Fox 64's script and multiply it exponentially. That's how much speaking is done in this game. Welcome back, my white-winged friend! Each of the game's multiple chapters are divided up between three types of mechanics. The first are sky battles which are akin to something like Sin & Punishment: Star Successor on Wii. These have you zooming along on an on-rails section, blasting at enemies while avoiding their fire and environmental hazards. The second mechanic are ground battles. These take the fighting directly to Medusa's tumultuous troops as Pit dukes it out with numerous foes either from far away or up close and personal. During these sections, there is ample time to explore for hidden treasure chests that contain helpful items, weapons, and health-healing food. 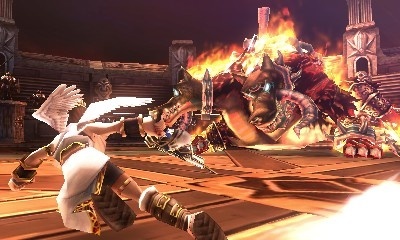 The final part of Kid Icarus: Uprising are boss battles. These put you in a three-dimensional arena with the goal of taking down the primary villain before they in turn take you out of the picture. Note that not every chapter follows the order of air/ground/boss. Some chapters mix the order up to keep things fresh and interesting. Air fighting controls really well and is intuitive. The main controls (you can switch and tailor which control scheme you prefer best) have you using the Circle Pad to move around, shoot with the L button-- you can either hold down the button for continuous fire or wait for the reticule to enlarge to blast a powerful charge shot-- and you use the stylus to aim. Clearing a particular wave of enemies nets you with bonus points and more hearts. Hearts as you'll discover later on in this review are paramount. Ground battles are a little more tricky. I would be doing a disservice if I said that they didn't take some getting used to. When a game comes with a stand, you know there might be a problem (my hand cramped constantly at first). The learning curve can be steep, especially for left-handed players. And seeing as there is no dual analog option to use the Circle Pad Pro peripheral with (though left-handers can use the CCP's analog nub to play), this can bewilder beginning players. A quick flick of the Circle Pad at the correct time allows Pit to nimbly dodge enemy attacks, and you move the camera around by flicking the bottom screen with the stylus. Just like Pit says in-game, think of it as spinning a globe. You also aim with the touch screen as well. Combining spinning the camera with aiming can be confusing at the start, but to be totally truthful, I found myself and the controls gelling together by the second chapter's conclusion. Of course, I quickly adapted to playing first-person shooters with the Wii remote and also played Metroid Prime Hunters on DS with stylus controls, so your mileage may vary. Even with the difficult to grasp controls, the fun outweighed any frustration 100% of the time. Boss fights often end chapters. You will be duking it out with plenty of foes familiar to Kid Icarus veterans such as Medusa's Underworld guard dog, Twinbellows, the always bickering trio of dragon heads, Hewdraw, and the "mist"-shapen head, Pandora. 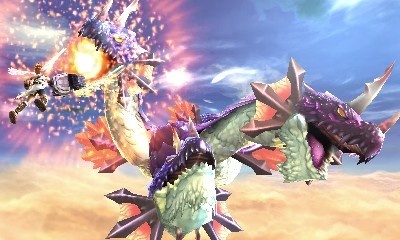 In these chapters as a prelude to the battles, Pit reminisces about his past encounters showing the original 8-bit versions of these monsters on the bottom screen. The tips of the hat to the NES classic don't end there either. Regardless, fights demand your full attention, particularly on higher intensities. Now this pooch would make a nice Nintendog. What do I mean by intensities? Well, there is a feature at the start of each chapter called The Fiend's Cauldron. The standard difficulty level is 2.0, but you can increase it up to 9.0 or as low as 0.0 for the price of a handful of hearts. Hearts are earned by beating enemies. The higher the difficulty, the harder enemies hit, the more attacks they unleash, and the more challenging to defeat foes are. Each time Pit gets finished, the player loses a fair amount of hearts and the game lowers the intensity by one full point. However, there is a beneficial side to playing on higher intensities. You earn more hearts and points as well as getting more powerful loot like weapons and powers, so there is a risk/reward nature to Kid Icarus: Uprising. Play as stress-free as possible or as self-destructive as you want. 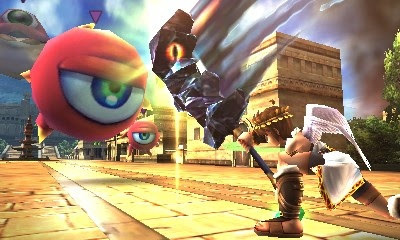 On the matter of weapons and powers, there are a plethora of weapon types for Pit to master and use such as blades, enemy shot reflecting clubs, orbitars, sniping staffs, and long-ranged bows, for starters. Each type of weapon has numerous iterations with different stats and bonuses. One Fortune Bow might be weak with low stats and low melee ratings while another Fortune Bow can have a power rating in the two-hundreds with stat bonuses like poison and petrification. Weapons can be fused together to create even more powerful forces of obliteration. Additionally, you can receive special stones from StreetPass or SpotPass that can be used (for a price) to create new weapons or to fuse gems together. Apart from weapons, powers can be obtained which grant abilities like armor, counter attacks when hit, powers to shoot off mega lasers and meteor showers, and much more. You receive a grid that you piece various blocks representing powers onto. As long as you have room to fit them, you can place as many powers as possible, or if you are lazy, you can have the game auto-fill a random selection of powers onto the grid. As they say, all's whale that ends whale. Aside from the meaty solo campaign, there is Together mode which is the multiplayer portion of Kid Icarus: Uprising. This can be played locally either with friends or with bots of custom difficulty, or it you can hop online to battle in special rooms joined by buddies or against the world and random strangers. There are two types of multiplayer battle: Free-for-All and Light vs. Dark. Free-for-All sounds exactly like it is. Up to six players charge around one of several well made maps trying to defeat one another. Every defeat gives a player points. The player with the most points win. Light vs. Dark is more complicated. Two teams of three, the light team and the dark team, do battle. Each time a person loses a life, their team's health bar goes down. When it reaches zero, the person who last perished comes back to the battlefield as either Pit (light team) or Dark Pit (dark team). The first angel/captain to be defeated is the loser. Light vs. Dark is more strategic than Free-for-all. Both modes allow you to equip any weapon and powers you received in the story, but in Light vs. Dark, the more powerful your weapon is, the more health your team loses when you are defeated. As for lag, I have played countless games online, and lag is seldom (if ever) a problem. The fast and frenetic action is enjoyable, and the hot and heated competition is always great for tense excitement. up with two other players. Much like most of Masahiro Sakurai's games (he's the creator of Super Smash Bros. and Kirby, don't you know), Kid Icarus: Uprising is packed with content and secrets. Like Kirby Air Ride and Super Smash Bros. Brawl, there is a challenge grid (three, in fact) that unlock content for accomplishing various goals such as completing a chapter within a set amount of minutes, beating a boss with a certain weapon, among other tasks. In total there are over 300 tasks to attempt. You get rewards like idols (think of Super Smash Bros. Melee and Brawl's trophies), music to listen to, weapons, powers, and new battle arenas in Together mode. This is by far the meatiest Nintendo 3DS game on the market, and it will last you hundreds of hours. Kid Icarus: Uprising is a fascinating to look at game. From the speedy flight sections where environments and enemies alike flash by you to the awesome special effects and lighting, Uprising does not play around graphically. Some enemies look better than others, but the amount of architecture, things to gaze upon, and everything running at a smooth framerate make for one incredibly impressive game. The 3D effect can sometimes be lost as you move out of the recommended viewing window, but it helps to judge distances between platforms and other dangers and how far away foes are from Pit. 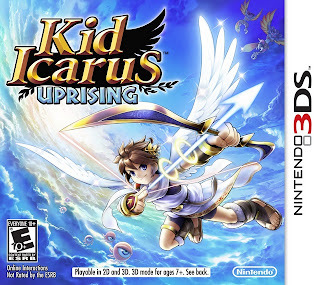 Musically, Kid Icarus: Uprising has other games this year beat with its phenomenal collection of orchestral pieces composed by a selection of the best composers in the business. We are talking about Yasunori Mitsuda (Chrono Trigger and Xenogears), Motoi Sakuraba (Star Ocean and Tales of), and Yuzo Koshiro (Streets of Rage and ActRaiser), to name a few. I found myself just sitting in the Music Player listening to these beautiful arrangements and melodies. I have broached a bit about the voice acting. Not only is it quite humorous, but it is performed exceptionally well. If you don't care for it, after you beat the game you can opt to silence them completely. This makes multiple play-throughs of chapters less strenuous on the ears. 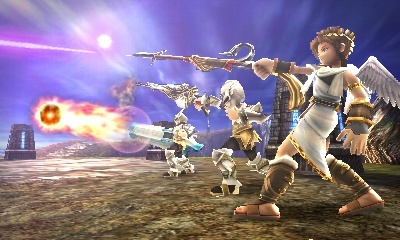 Kid Icarus: Uprising manages to be worth the long wait for the game. The amount of content is simply staggering with twenty-five chapters to complete, a competent multiplayer element with functional online, a myriad of unlockable content, sliding difficulties for the most advanced and the poorest of gamers, a wide selection of weaponry and powers, colorful, playful, self aware voice acting, and one heck of a symphonic score. The ground controls hold this game back from being perfect, and they can be quite a hurdle to jump over. However, once you master them (it depends on what type of player you are) you will discover a game that is remarkably unforgettable. Here's looking at you, kid.